The earliest man-made glass objects, mainly non-transparent glass beads, are thought to date back to around 3500 BC, based on archeological finds in Egypt and Mesopotamia. Glass blowing didn’t emerge until the first century BC and glass windows were first used in Rome a century later. Through all this history, while beautiful objects were created from glass, it was seen primarily as a utilitarian material. Studio glass — glass sculpture — is a modern phenomenon, originating in Czechoslovakian factories in the mid-20th century. In 1962, artist Harvey Littleton at the University of Wisconsin discovered that some glass could be melted at low enough temperatures to allow the use of small home-studio furnaces. His discovery energized an art glass movement in the United States; his star student was Marvin Lipofsky who subsequently established the studio glass programs at the University of California Berkeley and at the California College of Arts and Crafts. Marvin Lipofsky: A Glass Odyssey is a retrospective exhibition of some 60 works by Lipofsky covering the forty year career of this influential and innovative artist. It is the rare medium that offers the artist a virtually clean slate. Lipofsky says, in a fine video by Paul McKenna that can be viewed at the exhibit, that there was little precedent, little prior technique with studio glass when he started out. His early pieces were experiments in which he explored what could be done with the medium, how glass reacted when manipulated in various ways. In the California Loop Series he glued pieces together and he used flocking and paint to cover surfaces. He says that at first he tried to deny the beauty of glass by covering it up. In other works he used electroplating, decals, and mirroring to cover the glass but, as his technique evolved, he no longer covered the surfaces. Lipofsky developed techniques to emphasize the beauty of the surfaces on which color and texture seem an organic part of the medium itself. He dabbled in Funk in his Great American Food series in the early 1970s, but Lipofsky comes into his own as an abstract expressionist, creating nonrepresentational forms that utilize his extraordinary skills to define space (and negative space), the heart of the sculptural process. His work often has the look of biomorphic forms — shells, undersea creatures, exotic flowers. Lipofsky has traveled extensively over the years, working with glassmakers in 17 countries around the world, learning from them and absorbing the influences of their cultures and geographies. He is a brilliant colorist and his palette, in particular, seems to reflect the location in which he was working — rich crimson in China, vivid circus colors in Kentucky,autumn colors in Yugoslavia. In Osaka, he created mold-blown glass pieces in the shape of cones, with color applied to the surfaces that gives the effect of Japanese brush painting. In Hokkaido, he added a bit of woven straw to nearly colorless sandblasted vessels. Pieces executed in Murano are elegantly highlighted with striped patterns. 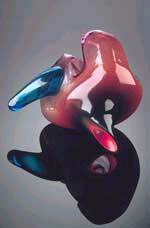 #4, a recent (1995-7) work done at the famed Pilchuck Glass School is peak Lipofsky work. A mold-blown vessel, sandblasted and acid polished, curves in irregular lines and shapes. Parts are cut away so that the interior can be seen; external dents and folds become interior protuberances. A range of vivid colors (blues, yellows, reds, oranges) naturally emphasizes the sinuous flow of the composition. While the sculptural "voice" of Lipofsky runs through all his work, marking it as unmistakably his, he continues to develop technique and expand his vision as well. Each work has a sense of the new, a freshness which enhances the sheer sensual pleasure that his art so generously offers.